The japanese expression for "Coffee" is Kōhī ( コーヒー). Coffee is almost becoming as popular as the green tea. 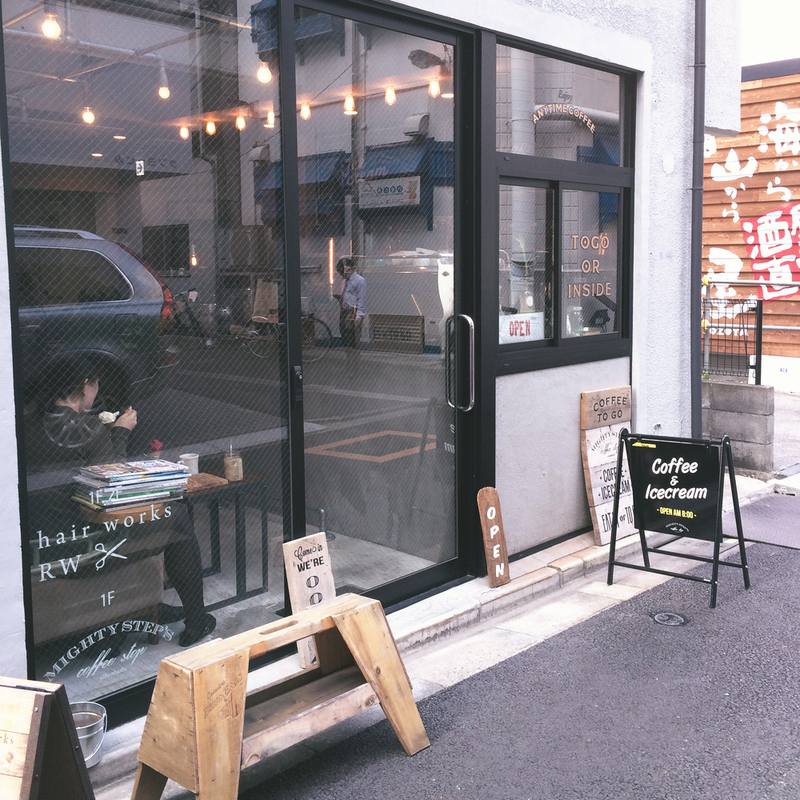 I guess you'll find more coffee bars in and around Tokyo, than tea-shops. Which actually comes in handy for myself. Before traveling back to Japan, more precisely to Tokyo, I informed myself in advance, which coffee places i'd would check out on my daily walks through the city. There was the place called "Mighty Step's Coffee Stop". I first found out about it, through a video on the video-platform Vimeo. Click on the following link, to watch the beautifully produced video "DRIP FOR U". I was really looking forward to visit this store in Tokyo. It took us around 40 minutes to get from our hotel front porch to the the mighty step's bar. On my first visit, the shop was closed. What a bummer! Two days later, I tried to convince my friend to get back, because I really wanted to bring back home a cup with the shop's branding on it. I still didn't own a coffee cup from Japan in my mug collection. After we walked in, we were warmly welcomed by the two baristas working at the shop. I was astonished how beautiful the tiny store was set up. The owner had put so much love and soul into that coffee bar, that was located in the entrance of a barber shop. "Mighty Step's Coffee Stop" offers different type of coffees, depending on its origins, and different flavours of ice-cream. The whole package is beautifully served on a wooden tray as you can witness on my photo above. I walked by a lot of different bars, but this one got my whole attention within a heartbeat. The coffee-bar is located in Nihonbashi and only walking distance away from the Mitsukoshi-Mae metro station. On our daytrip to Kamakura, which is only an hour-train-ride away from the busy city of Tokyo, I randomly discovered a coffee spot called "Farm for you". The organic place was divided into a restaurant, coffee roastery, and a bakery. We just grabbed a cup of coffee from the outside, to enjoy the summer weather from the porch of the shop. Once again, I could witness with how much love the barista, surrounded by different chemexes, a coffee roaster, and all sort of accessories, made the coffee for the customers. A cup of coffee was about 500 yen, and it was worth every single copper coin. Of course the coffee tasted best, with a piece of carrot cake! What a lovely place! Delicious columbian coffee!